NASA recently posted a fascinating artistic conception of what Earth might have looked like more than four billion years ago. Compared to what it looks like today, Earth's early years were much, much different—to the point where the planet isn't even recognizable. In fact, it was during this time that research suggests giant asteroids—some as large as 600 miles wide—struck Earth repeatedly, causing a kind of rebooting of the surface, where large portions of our planet was "melted, mixed and buried." "A new terrestrial bombardment model, calibrated using existing lunar and terrestrial data, sheds light on the role asteroid collisions played in the evolution of the uppermost layers of the early Earth during the geologic eon called the "Hadean" (approximately 4 to 4.5 billion years ago)," NASA explained. Battered by these immense impacts, deep-seated magma ejected onto the Earth's surface, which is represented in the image you see above. Amazingly, even with magma covering the Earth's surface, researchers believe distal portions of the surface was still able to retain liquid water. But even with such intense puberty, the Earth was able to recover from these extinction-level incidents, eventually evolving into the planet we live on today. It makes you wonder what other planets out in the great big universe have gone through the same thing. Or, even more frightening, if it's possible for Earth to go through a similar phase of growth. According to the research, Earth has gone through a number of major growth phases (something we knew already), including the period described above when these giant asteroids—which would have dwarfed the asteroid that killed off the dinosaurs—periodically pummeled our home planet. But it was through these collisions that Earth's geology was not only altered, but sparked an evolution of life. The newest research says that an impactor more than 300 miles wide was capable of global ocean vaporization, while an impactor more than 600 miles wide was capable of global sterilization. 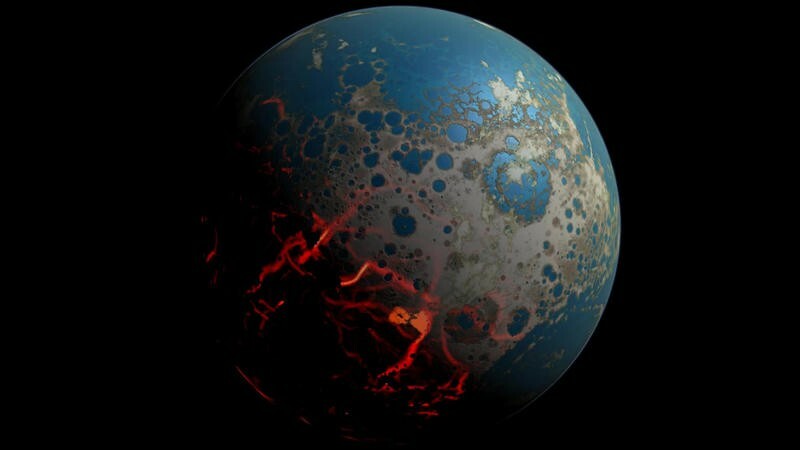 But even with such large impactors, researchers believe there was enough time between collisions that life may have existed during the Hadean eon period, though it would have been "in niches deep underground or in the ocean's crust," said Simone Marchi, senior researcher as the Southwest Research Institute in Boulder, Colorado. Even in the direst of circumstances, nature seems to find a way.